Although Jens Weidmann may have been alone on the ECB executive board in opposing yesterday’s ECB decision to buy government bonds, he looks to have the full-force of German public and media opinion right behind him. 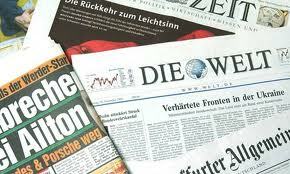 Over the last 24 hours, the German media, with surprisingly few exceptions, has fired a broadside against the ECB. No holds barred. Mario Draghi may have pleased markets, but he now has a very frustrated Germany – whose taxpayers are implicitly underwriting his institution (and the euro) – on his tail. Meanwhike, Die Welt led with the headline “Financial markets celebrate the death of the Bundesbank”, adding, “For Germany, the nightmare begins. There it was: the word that everyone was waiting for: unlimited…ECB President Draghi brazenly breaks with the principles of German monetary policy.” Bild runs with a similarly eye-catching headline, warning against "Draghi's blank-cheque for debt-states". The warning on the German Constitutional Court is an interesting one (a topic we’ll discuss in future posts) but some politicians went even further, with Hessen Europe Minister Jörg-Uwe Hahn of the FDP and CDU’s Klaus-Peter Willsch (already the initiator of one of the ESM complaints to the German Constitutional Court) calling for the German government to seriously consider taking the ECB to the European Court of Justice for violating its legal mandate. The ECB wasn’t the only institution on the receiving end though, with the German government and Chancellor Merkel also taking flak. Handelsblatt's deputy editor in chief, Florian von Kolf wrote, “Today is a black day for democracy…Merkel is silent…seemingly happy to have been partly relieved from her here Sisiphus task to save the euro”. DPA reports that SPD parliamentary leader Frank-Walter Steinmeier argued that the ECB’s decision is the “documentation of Chancellor Merkel’s failure...[while Weidmann] protests but Merkel gives the green light”, while the Green party decribed the CDU and FDP opposition as “hypocritical” since it was their failure to take any significant decisions on the crisis which forced the ECB to act. In the UK we have a saying, that it is not worth flogging a dead horse. Can someone pass this to Mr Draghi in italian. It will be either the death of the Bundesbank as we know it; or the death of the Euro as we know it. Which one would you bet on???? The same as you, money talks and PIGGS walk (and do not fly). You have simply no platform to base a 10 Y or so rescue exercise on. Either the North will pull the plug out of the rescues (if they start to feel the cuts in their own goodies or the South in their Euro-membership when austerity hits them to hard and fatigue sets in. Or more likely both with some timing differences. They simply donot have their PR/Communication strategy ready. The times of telling A in Europe and B at home are over especially for headline topics. If you say to the markets we save the Euro, you say at the same time to the Germans you pay for it. That is what we see here. Handellsblatt had an interesting topic on this as well btw 13% pro ECB-buying and 51% against (and a lot undecided). And Draghi well basically Draghula. ^----- (Rollo) Germany has come through much worse and survived. This will noy be different. It would be naive to expect anything much from the German constitutional court. The author is Dr Gunnar Beck, who "teaches EU Law at SOAS, University of London, is a practicing barrister and a former legal adviser to the European Scrutiny Committee of the House of Commons" and "is the author of The Legal Reasoning of the Court of Justice of the EU" which will be published next month. "The ESM manifestly breaches German constitutional law as well as the EU Treaties. Indeed, violations of the Constitution rarely come so clearly." "... the diligent, knowledgeable and naive legal academic will think: If the law is clear, then the court will enforce it. His conclusion will be that the ESM Treaty should and will be struck down. Anyone who does not only know the law but something more about the law, will be less sure: he will know what the legal answer should be but is aware that the world is not as it should be, of the pressures the court is under, the fact that all members of the second senate of the court are party political appointments - all appointed by parties which have been supporting the ESM - and that courts are not in the habit of causing constitutional crises." "The author has been told by one of those in the know - government officials, top investment bankers and CEOs, and well placed journalists - that according to trusted "highest government sources" in Germany there have been close contacts between the court and the German government - an astonishing fact itself - that the Government has been assured by the judges that the court will not stop the ESM but is likely to insist on a reservation or two and ask the federal president to attach a rider to his signature under the ESM Treaty to the effect that it is Germany's understanding that her liability under the ESM will not be unlimited." "The author hopes that this article will find at least some readers in China, Southeast Asia and in the Islamic world so that they may remember a thing or two about 'constitutional government' in the West when the Western leader arrives on their shores to lecture them about the 'benefactions' of the 'the rule of law', the separation of powers and human rights in the West." When we start talking legal stuff. The plan was leaked via GS (Goldman). Leaking as such is ok but via a party that is likely to benefit from it first, before leaking it further to the market? Anyway it looks to me that if that (benefit) would have been done also some people at the ECB would have a case to answer (for conspiracy). The problem with German lawyers is they take a position and start to defend that. So basically what we see is some lawyers saying it is unconstitutional and others saying of course it is allowed. Totally unuseful for spectators like ourselves. Basically the GCC has approved the earlier version of the ESM in the ruling a year ago or so. And has given rather broad criteria. From a later interview it appears with the former ESM we are basically on the border allowed not allowed. It looks to me within that scope they can basically move either way. Also from a legal pov and not only to avoid a constitutional crisis. As apparently everybody is afraid to shoot the dead horse, more likely is an approval. With conditions otherwise the next case can almost directly be booked in and they probably will try to avoid that as well.